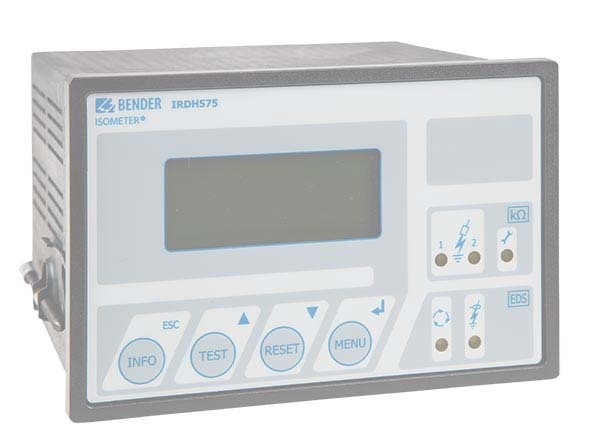 The ISOMETER® of the IRDH575 series monitors the insulation resistance of unearthed power supplies (IT systems). It is suitable for universal use in 3(N)AC, AC/DC and DC systems. AC systems may include extensive DC-supplied loads, such as converters or thyristor-controlled DC drives. The IRDH575 in combination with EDS4… series insulation fault locators and the appropriate measuring current transformers is designed to set up the respective equipment for insulation fault location. The adaptor allows fast mounting of the IRDH575 on a DIN rail according to IEC 60715.